According to Google CEO Larry Page, Google+ already had 10 million users at only two weeks old. By contrast, Facebook took more than two years to reach that number and only surpassed it after opening its network beyond secondary school and post-secondary students. So what is Google+ and would a small or medium-sized enterprise (SME) want to use it? We explain some of the advantages and things you should watch out for below. Don’t forget! Benchmark your blog – measure for impact – use My.ComMetrics.com and improve your blog’s performance. CyTRAP Labs can help you improve your social media efforts. Start a conversation! Email us at info [at] CyTRAP [dot] eu or call us at +41 (0)44-272-1876. 1. Why use Google+; to reach whom? As with Facebook, using Google+ without a purpose or strategy is not a good way to get started. Social media is a time sink, necessitating a clear rationale for engaging your target audience via whichever channel. Tip 1: Use Google+ to get intel and share content your clients crave (as with Twitter, it matters who you follow, not who follows you). Unless content helps them do their job better, why waste their time via Google+? By the way, to considerably reduce your Gmail traffic, un-check all unwanted Google+ notifications in Google Account options. 2. Which content can be shared using Google+? Once you have identified your reasons for using Google+ (reach out to friends and/or engage clients), it is time to address what kind of content to share (see orange field). You can disable re-sharing of a certain post after posting it by clicking the red arrow in the upper right-hand corner and then selecting Disable resharing (see above). Tip 2: Once it is published, via Google+ or otherwise, you cannot take it back. While you keep the copyright, Google’s Terms of Service (TOS, see 11.1 to 11.3) state that you give Google a perpetual, irrevocable, worldwide, royalty-free, and non-exclusive license to reproduce, adapt, modify, translate, publish, publicly perform, publicly display and distribute any Content which you submit, post or display on or through, the Services. Remember that the same applies to Twitter and Facebook. To keep the rights, it is best to share your most valuable content through your website. 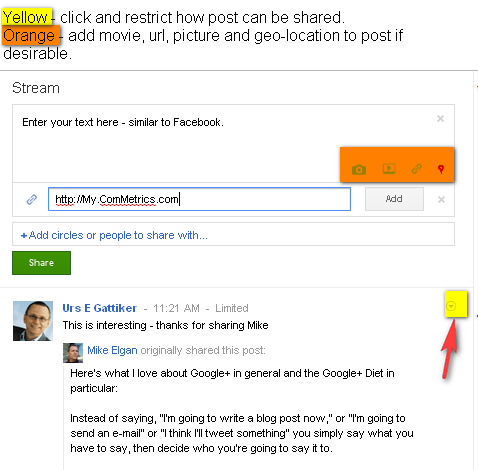 Use Google+ for sharing a URL to your blog post or where to download your white paper instead of giving it all away. 3. To get the content right, decide whom you wish to share with. My Customers compares to a business newsletter. I limit using Google+ for my business, because unlike with Facebook, it is currently impossible for a business or brand to have a Google+ page. Tip 3: Try to post things that encourage engagement by asking questions or providing a link to great content (e.g., white paper, checklist and/or blog post) and always use the KISS principle (keep it simple, stupid). 4. Whose image will get posted to your page? While you may be connected with some of your clients and even have a special group called Customers, they may not want their profile picture shown on your Google+ account. You must respect their decision; unless you asked for and got explicit permission to show their image on your profile, do NOT do so. By clicking on the upper right-hand side screen (see above) and choosing Google Settings, you can change these options. To address the visibility issue, click on Profile and privacy and then the orange button, resulting in something similar to the image below. 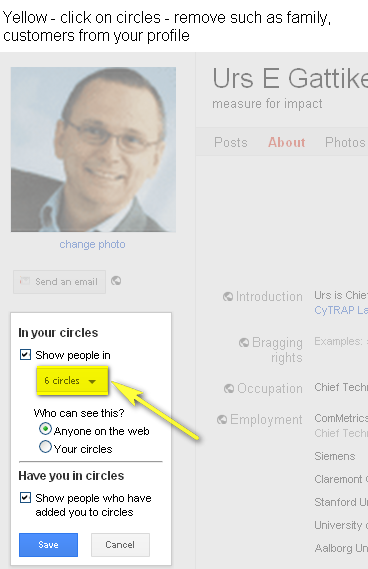 By clicking Circles (highlighted in yellow), you can decide whose image will or will not appear on your page. De-selecting a box will ensure that images of people in those circles do not appear on your profile. In addition, you can determine under the privacy section what will and will not appear on your public Google profile (a kind of CV with Google). Tip 4: Follow the EU privacy directive – unless your clients or family members give explicit permission to show their image, they have opted out by default. Respect people’s privacy. Note: Special thanks to @pamdyer, whose article 25 Google Plus resources, articles, and reviews to help you get started inspired me to write this post. Disagree? Sure. Leave a comment!Just one question I hope you will answer: Why and how do you use Google+ or why not? I look forward to your comments below. Thanks for sharing your insights concerning Google Plus. Do you like Google Plus? For professional reasons, which network do you prefere: Google+ or Facebook? Personally i like Google+ – at the moment there is a lot of useful content that streams into my news feed. On Facebook you can find a lot of good stuff as well, but you might have sorted your contacts into lists, so that you can chose the content of a specific group of “friends”. If you do not filter your feed, there will be a lot of unuseful information on Facebook. Sure, this might be the case on GooglePlus as well, but I doubt that the mainstream user will switch to G+. Actually I would love to have G+ as a geek network. Will Google Plus become a mainstream platform? To answer your question, for me I prefer Google+ over Facebook when it comes to business. I have yet to really check my feed on Google+ carefully though. It is still a thing of trying to find my ways and exploring the possibilities. – Facebook is a social cake trying to add an algorithmic frosting. I truly believe that thanks to the added social frosting, Google can keep us coming using its tools and, thereby, remain the leading search engine. In turn, its revenue stream remains secure…. all under the assumption that it works as planned, of course. Thanks for your input. I am not sure if the issue is to be a ‘popular person’ or another but more what you intend to use Google+ for, would you not agree? So until then I continue to try and learn from people’s Google Plus feed – like I do from yours which I just added to one of my circles today. Great! For sure we have to learn much more about this new service, but I guess Google want something different then Twitter or Facebook (for they and for us), but will we use it? I think you are right with this one. By the way, the competitive threat by Google Plus has forced Facebook to change the way it allows you to share content, very interesting. What you think about this change, better for us users, right? and develop the platform further. – love butter but do you want to be friends with your butter on Facebook? I am glad you like my blog and this post in particular. Hope that you will comment again soon on one of the upcoming posts. Previous post: URL shorteners: Got a recommendation?